Left: Roberto Guerra, photographed by Kathy Brew. Right: Nell Cox and Gene Stavis, photographed by Sally Shafto. 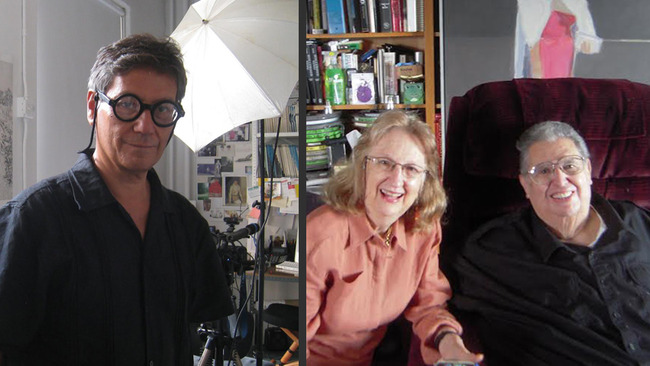 This winter marks the first anniversary of the deaths of two New York film personalities: the film professor and collector Gene Stavis (1943–2013) and the Peruvian-born filmmaker Roberto Guerra (1942–2014). Living in Morocco, I didn’t hear about this sad coincidence until later last year. I’d had the privilege of knowing them both, in connection with the subject of the American Cinematheque project, the ill-fated brainchild of the larger-than-life cofounder and director of the Cinémathèque française, Henri Langlois (1914–77). A longtime resident of New York, Gene was well known as an ardent cinephile and gifted teacher. He taught for thirty years at the School of Visual Arts. My research on the American Cinematheque first developed out of a serendipitous meeting with Gene in 2000 when an old friend, Keith McCarthy, invited me along for a private screening at Gene’s Waterside Plaza apartment. Keith had worked for Gene and spoke of him almost reverentially. If I no longer remember what that evening’s film was, I do recall being amazed at the stacks and stacks of film cans strewn casually around his apartment. The centerpiece in Gene’s living room was an enormous photo of Langlois that topped a low bookcase in front of a window overlooking the East River. It was Gene who told me about a wonderfully quirky 1970 documentary Roberto had made with Eila Hershon, Langlois, which features numerous interviews, all in English, with stars like Catherine Deneuve, Simone Signoret, and Jean-Pierre Léaud, and is narrated by Langlois himself, with his mellifluous voice. Gene put me in touch with Roberto, and shortly after meeting him and watching the film, my research into Langlois’s proposal for the American Cinematheque began in earnest. The project had gotten off the ground in late 1968, after Langlois met Tom Johnston, a former aide to Robert Kennedy with a keen interest in film. A scion of the Carnegie family, Johnston immediately hit it off with the charismatic Frenchman. Soon thereafter, Johnston hired Gene as his assistant. Together this unlikely trio began planning a film complex in New York. (On meeting Gene, Langlois reportedly queried him about his last name. Had Stavis, he wondered, been truncated at Ellis Island? Langlois was all too delighted to learn that Gene in fact shared a patronymic with Serge Stavisky, the notoriously charming swindler who nearly brought down France in a financial and political scandal in 1934.) Although backed by some important players on the New York cultural scene and even conceptualized in drawings by the architect I. M. Pei, the cinematheque was, alas, not meant to be; the American zeitgeist was against it. I recount the sad details of this ambitious but doomed enterprise in my essay “An American in New York,” published in the Cinémathèque française catalog commemorating Langlois’s centennial in 2014. In researching this article, I had the pleasure of seeing Gene again in August 2013. On my second visit, I was joined by an old friend of his, filmmaker Nell Cox, who played a crucial role in the development of the Frenchman’s American dream. Nell, who knew Langlois through her work with Richard Leacock and D. A. Pennebaker, was responsible for introducing Langlois to Johnston. She and Gene hadn’t seen each other in years. Besides his passion for film, Gene was known for his avoirdupois as well as his wit. Langlois, he proudly told me, had bequeathed his tuxedo to him, since they were about the same size. A widely circulated story recounts that Gene once met Groucho Marx at a Hollywood soiree. One of Gene’s sallies so impressed Groucho that he dubbed him “the funny man”! Many in New York will also recall Gene as an early gay rights activist. Most of all, though, Gene was a wonderfully kind and decent man who deserves to be remembered. Roberto Guerra deserves to be remembered, too, notably for his numerous documentaries, often portraits of artists: Tricia Brown, Konrad Klapheck, Frida Kahlo, Coco Chanel, Karl Lagerfeld, Hans Haacke, and Oskar Kokoschka. Recently, his work was honored at the fifth edition of the New York Peruvian Film Showcase. His widow and longtime collaborator, Kathy Brew, wrote a moving portrait of him for Artforum. Born just a year apart, Gene and Roberto belonged to the vanguard of the baby boomer generation whose idealism, like Robert Kennedy’s, helped change the world for the better.